David Shelton Gallery is pleased to announce the opening of <3,an exhibition featuring work by Matthew Craven (Los Angeles), Benjamin Edmiston (Brooklyn) and Alison Hall (Brooklyn). The intersection of A, B and C is bound by repetition, pattern and form. Elements in all three sets of A, B and C mine historic narratives that inform a futuristic fantasy. Hand-drawn and found images allude to Chinese symbols, Egyptian hieroglyphics, Assyrian script and the pagan alphabet; graphic compositions reimagine a language influenced by and connected to modern architecture; and de-constructed geometric abstractions reference Early Italian Renaissance frescoes. The equivalent of all elements contained in sets A, B and C is <3. 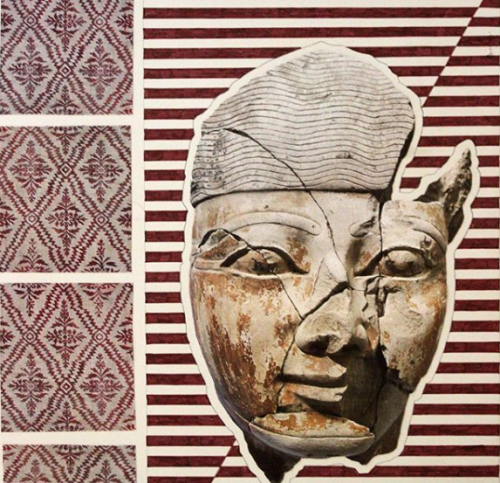 Alternating between the hand-made and found images, Matthew Craven (A)reconfigures original historical narratives by fusing hand cut imagery from history textbooks onto backgrounds of geometric symbols and textile patterning, meticulously drawn on the reverse sides of vintage movie posters and found paper. Obsessive repetition of color and motif join contrasting thoughts to create a surreal vernacular built on transformation, precision and vibrancy. Placed within this new symbolism and meaning, the found images lose their original context and carry on within a newly imagined, temporal. Craven received his MFA from School of Visual Arts in New York and his BFA from Michigan State University. He has had exhibited widely in the United States and abroad, including solo and two-person exhibitions at Asya Geisberg Gallery, New York, NY; DCKT Contemporary, New York, NY; Allegra LaViola, New York, NY; Marvelli Gallery, New York, NY; David Shelton Gallery, Houston, TX; Gallery Hijinks, San Francisco, CA; Packing, Detroit, MI; and Get This! Gallery, Atlanta, GA. He has been included in group exhibitions at UB Anderson Gallery, University at Buffalo, The State University of New York, NY; Muster-Meier, Switzerland; Richard Heller Gallery, Los Angeles, CA; Perry Rubenstein, New York, NY; and The Hole, New York, NY; among others. Craven has recently participated in the Marfa Myths Artist Residency in Marfa, TX. 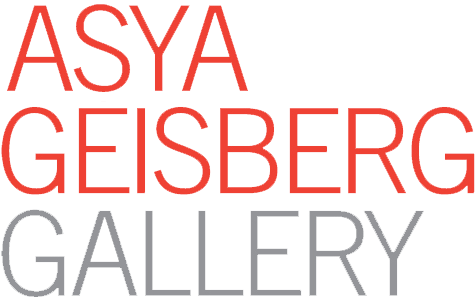 He has been reviewed in The Brooklyn Rail, Art Critical, The Huffington Post and Burnaway, and has curated exhibitions at DCKT, Asya Geisberg Gallery and Nudashank. Benjamin Edmiston’s (B) sophisticated abstract paintings and drawings favor restraint over abundance. Geometric compositions with an identifiable hand painted touch, Edmiston’s work uses the language of architecture as impetus. Intimately scaled paintings resonate with flat, bold color or (in many cases) black and white. Each are direct and confrontational, yet simultaneously leave space for the viewer to wander. Edmiston earned his MFA from Brooklyn College in 2012 and his BFA from Tyler School of Art in 2003. Recent solo and two-person exhibitions include David Shelton Gallery, Houston, TX; Left Field Gallery, San Luis Obispo, CA; Vox Populi Gallery, Philadelphia, PA; and Residency Gallery Gallery, Hudson, NY. He has been included in several group shows including False Flag Gallery, Long Island City, NY; Charlotte Fogh Gallery, Aarhus, DK; and Cuevas Tilleard Projects, New York, NY. He was an artist in residence at OCAD University, Toronto, Canada and was nominated for the Joan Mitchell Foundation MFA Grant. Edmiston’s work has been included in New American Paintings and The Age of Collage: Contemporary Collage in Modern Art. Alison Hall (C) lives and works in Brooklyn, NY, and Martinsville, VA. Hall looks to the ritual and repetition of her upbringing in rural Virginia, tempered with a devotion to early Renaissance artifacts in central Italy. Drawing on her ongoing study of patterns in the Arena Chapel’s fresco cycle by Giotto (Padua), Hall searches for visual systems in 13th century ceilings, floors and paintings. She de-constructs these – such as Giotto’s eight pointed asterisk constellations, diamond shaped grids and six pointed mosaic stars – conjuring her own geometric abstractions. Floating reflective graphite patterns over dense fields of oil pigment laid over sanded plaster, Hall imbues these ritualistic rhythms with subtle movements and patterns. When she breaks from these, it reveals the surreptitious presence, like a tracking marker, of her hand, in the midst of rigorous abstraction. Hall has had solo exhibitions at TOTAH, New York, NY; Galerie Gisela Clement, Bonn, Germany; Reynolds Gallery, Richmond, VA; and Philip Slein Gallery, St. Louis, MO. She has been included in shows with Ross Bleckner, Andrew Forge, Michelle Grabner and others at Steven Harvey Fine Art Projects, New York, NY; Kate Werble Gallery, New York, NY; John Davis Gallery, Hudson, New York, NY; and McKenzie Fine Art, New York, NY; and has been exhibited at the Taubman Museum of Art, The Virginia Museum of Fine Arts, and The William King Museum. In 2011, Hall was the recipient of the Virginia Museum of Fine Arts Fellowship in Drawing and the Bethesda Painting Award.